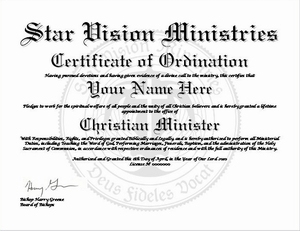 You must be a Minister ordained by Star Vision Ministries to order from this page. 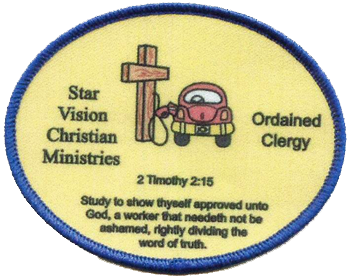 To see our Ordination Program click here. 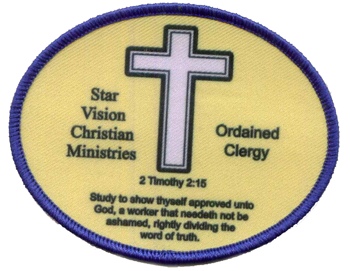 The following items are available to Ministers Ordained via Star Vision Ministries. Requests for any of these items may be made by sending an email to Star Vision Christian Ministries. Payments for items requested must be made via PayPal, and sent to the PayPal account grace_computers@att.net. 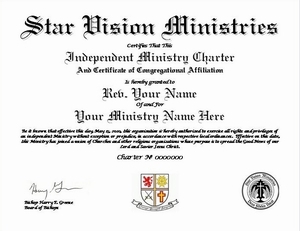 Star Vision Ministries will no longer email credentials to candidates upon completion of the program, but will provide the option of ordering the credentials from this website. If you want a Photo ID you will need to email a digital photo to Bishop Harry Greene at This Address. Otherwise we will issue a Non-Photo ID Card. You may also order just the ID Card. We offer a non-photo ID Card for $7.50 USD or a Photo ID Card for only $10.00 USD. 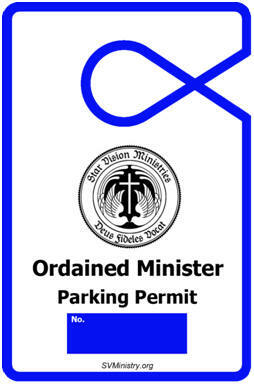 We offer the Parking Permit shown above by itself for only $6.50. Order it here. 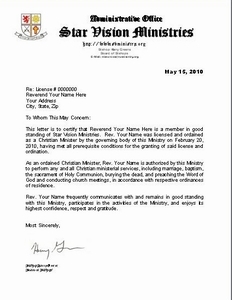 This letter signifies that the individual is in communication with and is in good standing with this Ministry. This letter will only be issued to individuals who establish and maintain consistent communication with the home Ministry. 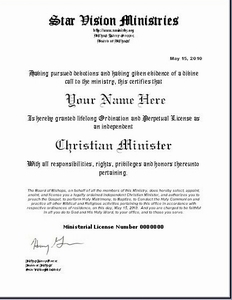 By accepting this letter you agree to report to the Ministry your actions and the status of your individual Ministry on a consistent basis. Printed on Ivory Parchment with a Watermark of Our Lord Jesus Christ in the background. 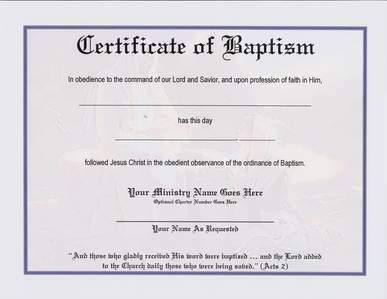 Your Ministry Name and Your Name printed on the Certificate. The Ministry Charter gives you all the rights of any Ministry or Church, whether online or physical, but does not impart tax-free status. To make it clear, the Independent Ministry Charter does NOT grant you 501(c)3 Tax-Free Status with the US Government. If you wish to receive 501(c)3 Status you must file paperwork independently with the US Internal Revenue Service. Please use the donate button below and specify which or both patches and quantity of each. Calculate total amount. All payments must be made in U.S. funds. All credentials ordered will be shipped on the 1st and the 16th of the month. While mandatory donations are not solicited, voluntary donations are always appreciated.